Lake Chapala is Mexico’s largest natural lake. On the geological timescale of millions of years, all lakes are temporary features on the earth’s surface. Once formed, natural processes begin to fill them in and/or to drain them. 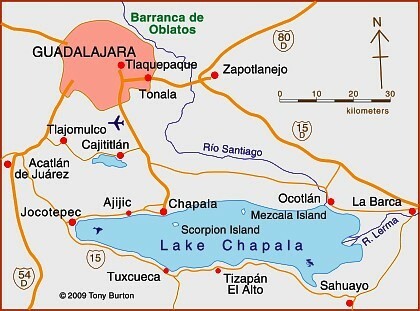 Map of Lake Chapala, Jalisco, Mexico. All rights reserved. Lake Chapala resulted from drastic earth movements, accompanied by earthquakes and faulting which occurred some twelve million years ago. Lake Chapala collected on the floor of a rift valley. Movements along the parallel systems of faults that caused the rift valley still occur today. Evidence for this continued movement can be seen in the cracked or displaced walls of some local buildings. Given its advanced age, it is not surprising to discover that Lake Chapala was once (thousands of years ago) much larger. In fact, though no-one has so far proven it beyond doubt, it may have been immensely large, covering an area seven times its present area, with a correspondingly long shoreline. At a later stage in its history, it became the deepest lake of an interconnected series of lakes which flooded the valley floors where the towns of Jocotepec, Zapotitan, Zacoalco and Sayula are today. The present Lake Chapala is thus probably only a small remnant of the original version. The lake is under heavier pressure than at any time in its existence. Local towns and the nearby city of Guadalajara see it as an inexhaustible supply of domestic and industrial water. Tourists see it as a recreation resource, and the thousands of foreign retirees who have settled on its shores see it as a major reason for the area’s beneficial climate. A case study of ‘residential tourism’ in the villages on the northern shore of Lake Chapala is discussed in chapter19 of Geo-Mexico: the geography and dynamics of modern Mexico. The levels of flow of the River Lerma, the only river of any size entering the lake, are crucial to the health of the lake. In recent years, demands for Lerma water have multiplied many times over, principally for farms in neighboring states, but also for industries. All the other rivers entering the lake are much smaller and, with rare exception, flow into the lake only a few times a year during the rainy season. The hydrology of Lake Chapala is discussed in chapters 6 and 7 of Geo-Mexico: the geography and dynamics of modern Mexico. The good news is that Lake Chapala was recently declared an Internationally Important Wetland by the Ramsar Convention, joining a large global network of similarly important wetland sites. The 13th International Living Lakes Conference was held in Chapala, March 22-25, 2010. This is an edited excerpt from Tony Burton’s Western Mexico, A Traveller’s Treasury (4th edition) . An interesting article. We take so much for granted.I will read more on this subject. I live on Lake Chapala. Though I haven’t traveled around much (wheelchair), there are quite visible mountains encircling the lake like a wreath. It’s hard to understand how it could have been larger once – deeper, maybe, rising up along the flanks of the mountains. At the present time, Lake Chapala is extremely shallow, the average being about 10 feet. As of now, it ‘s about 10 miles wide and 60 long. One of the mountains is an old volcano at the western end of the lake, with a crater tipped to the east, where it is easily seen, called Mt. Garcia. If the lake was once much bigger, it would have to mean that the east end is flat enough for the water to spread out horizontally. I’ve never been there, so I can’t say. It cannot do so where the mountains flanking its shores exist. It can only go up. I read no mention of the plateau. It is crucial to any understanding of the geology of this region. It’s a mile high, and extremely large. I’ve always wondered how the plateau was formed. But even more curious is how mountains came into being on top of it, encircling the whole lake. If the lake is on a rift, there should be geological evidence of that. From what I’ve learned, there is still a possibility that the lake is water which filled in a caldera. This article says no, but I have found some reasons to think the research is minimal, or even somewhat inept. So the jury’s still out on the caldera, in my view. Lake Chapala is on a gargantuan plateau that stretches north to Guadalajara and possibly beyond. That plateau is a mile above sea level, and water boils at 202F. What’s odd is how such a high plateau could have actual MOUNTAINS on it. The article doesn’t even mention that. The lake is also very close to the huge Basque de Primavera, a volcanic area near Guadalajara to the west. It’s a national park. We here are east and south, but not very far away, geologically speaking. There is a very likely connection. The Basque area features Rio Caliente, or “hot river,” which is near to boiling. I think it’s a mistake to recognize the Basque without any mention of either the plateau or a possible relationship to this area. Guadalajara and our lake area are on the huge mile-high plateau, and the Basque de Primavera may be on it also. This whole region of the lake is volcanic in nature, but not actively so. More like simmering. There are hot springs, some fumaroles, even a geyser or two, and the ground water isn’t far down, but is almost boiling. Therefore the magma chamber must be fairly high, rising perhaps above sea level itself. That’d be interesting to know – a magma chamber you’d have to look up to see from the seashore. If it was visible, that is. There was a terrible accident many years ago, where a group of men were digging near Chapala, and got down to the level of the very hot underground water. One of them fell in, was swept away, and was never seen again. I frankly feel that this area’s geology has been very poorly and inadequately studied. The towns around the Lake’s shores are all built on sloping land leading to the surrounding mountains. In heavy rainfall, some streets run with whitewater down to the lake. I’d like to see this region given the kind of scientific attention it deserves. It’s not spectacular, but has some unique scientific mysteries. Thanks for your detailed and interesting comments on what was only ever meant as a summary article about the formation of Lake Chapala. My background includes positions teaching geography and geology and I am very familiar with the area and the various places you describe. I’m sorry I don’t have the time to respond fully to all your points, but suffice it to say that the area has been very well studied by geologists, starting with a detailed account by Henri Galeotti in the mid-nineteenth century, an extract from which is included in my Lake Chapala Through the Ages, an Anthology of Travellers’ Tales and continuing into the twentieth century. The bibliography on Chapala’s geology is extensive though much of the best material is in Spanish and many of the articles (in Spanish and English) are in academic journals that may not be readily available to you. – George W. Mitchell. “Investigation of ‘Lake Jalisco’ (A Pleistocene Lake in the Central Region of Jalisco.” Mines Magazine (Colorado School of Mines) February 1965. That Lake Chapala occupies a graben (rift valley) and not a caldera has been known and accepted for many decades. Mexico’s foremost geologist, the Swiss-born Federico Mooser, now in his mid-nineties, co-wrote an article about this in 1972. – Díaz, E. and F. Mooser (1972). Formación del Graben de Chapala. Soc. Geol. Mex. Memoria II, Convención Nacional, 144-145. (Spanish). – Victor H. Garduño-Monroy, J. Spinnler and E. Ceragioli, “Geological and structural study of the Chapala rift, State of Jalisco, Mexico”, Geofisica Internacional (1993) Vol 32, No 3, 487-499. Pp.35-49 in: T. CLEMENTS (ed. ), Essays in Marine Geology in Honor of K. 0. Emery. Univ. S. Calif. Press, Los Angeles. – Valle, P. F. Simoneit, B. R. 2005. “Hydrothermal bitumen generated from sedimentary organic matter of rift lakes at Lake Chapala, Citala Rift, western Mexico.” APPLIED GEOCHEMISTRY, VOL 20; NUMBER 12, pages 2343-2350.